Effective moisture control is an important part of any home maintenance project. Too much humidity promotes mould growth, worsens indoor air quality, and aggravates allergies in some people. Mould turns into a big problem when it damages your valuable possessions and the structure of the house. And the most effective way to control these microbes is to regulate moisture. Mould can appear and grow in almost any room in the house. To help you out, here are some easy-to-follow tips to control moisture in these mould hotspots. Where there is water there is moisture, and most likely, moulds. Paint or wallpapers peeling off, windowsills starting to rot, water dripping from vents, or tiles starting to curl are all signs your bathroom has a moisture problem. Try using cooler water during showers. This puts less moisture into the air and also uses less energy. Drain the water properly. A small puddle on the floor, splashes on the wooden wall, or condensation on the ceiling all add up not only to promote mould growth, but also damage these surfaces. Increase ventilation by using the exhaust fan or opening windows during and after your hot shower. The key is to keep the bathroom as clean and dry as you can. Water streaming down the windows, moisture under the sink and counters, peeling paint, curling tiles, and wet stains on cabinet doors and other wooden surfaces are signs you have a moisture problem in the kitchen. Use the vent or exhaust fan every time you cook to reduce moisture in the room, especially when there’s too much steam or smoke from your cooking. Don’t simmer foods for excessive lengths of time. Always check the pipes for leaks. The living room often doesn’t come up when it comes to moisture problems, but it should be one of the first areas to check as it is often the room where air from the HVAC converge. Make sure you’re using quality insulation that not only keeps in heat, but keeps away moisture. Our range of insulation and ventilation products will all deal with your moisture problems. We offer a wide choice of solutions that remove moisture-laden air, improve the indoor air quality, and add value to your home. Your HVAC is one of the most important systems in your business, and a poorly insulated HVAC system can create serious problems. It is a branching network of tubes in the walls, ceilings, and floors, carrying the air from the central furnace and air conditioning to each portion of your business. So if one of your ductworks is leaking, it reduces the HVAC’s efficiency. This may also create problems that require costly repairs, shortening the lifespan of your industrial equipment. Our HVAC insulation offers these industrial benefits. Austral Insulation’s Enviroduct HVAC Insulation improves air quality by reducing the amount of chemicals and dust that circulate throughout your plant. There is a lower chance that allergens and pollutants will escape and get into your business with insulated ducts. HVAC insulation minimises heat losses and gains, and delivers air closer to your desired temperatures. This can help with common comfort problems such as a work area that is too cold in the winter and too hot in the summer. Condensation is a common problem with HVACs with air ducts. Too much moisture due to duct leak can result in mould, mildew, and fungi growth. This can cause health problems among your workers. Austral Insulation’s HVAC insulation is greatly beneficial in reducing condensation around HVAC ducts, thus reducing the growth of these allergens. Leaky ducts lessen your HVAC’s efficiency. With our glass wool and rock wool insulation products, you can increase your HVAC’s efficiency and lower your energy bills. Plus, if you are on the hunt for a new cooling and heating equipment, a well-insulated HVAC system may allow you to downsize to a smaller, more affordable HVAC unit that will provide better dehumidification and comfort. Stop energy waste. Insulate your HVAC and start lowering your energy bills. Austral Insulation offers a variety of excellent products designed for the HVAC insulation in industrial environments. All our insulation materials are ideal for external and internal HVAC ducting, making it a durable choice for your HVAC sealing needs. Call us now to get a quote for your industrial insulation. 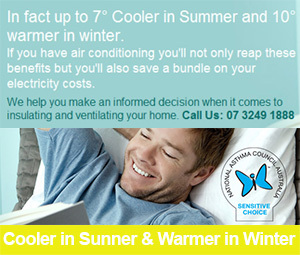 Not sure how to maintain a stable, comfortable level of cool during these hot months? Keeping your home cool shouldn’t mean leaving all those air conditioners turned on the entire day. This will only produce excess noise and cause a spike in your monthly electricity bills. Thermal insulation – this is your answer, and we specialise in providing it. Maintaining a stable level of cool is the key to home comfort. Our range of thermal insulation solutions will provide an affordable way of maintaining steady temperature in your home all year round. And note that we only use the most reliable and safe materials to help maintain that precious chill inside your property. Your ACs account for almost 40% of your monthly bills, and proper insulation can result in huge cost reductions while still giving you the comfort you want. During its existence, your thermal insulation will pay for itself multiple times, giving you high returns on investment. Apart from acoustic insulation, which is also one of our services, thermal insulation also acts as a sound inhibitor, reducing the amount of noise that enters your household. By lowering noise levels, you and your family can sit back and relax; no noises and hassles from the outside. This is especially beneficial if your house is on a busy street, or near flight paths. Other than maintaining a stable and comfortable temperature inside your property, our thermal insulation is one of the many home upgrades you can make that will truly add value to your property. Our Gold Ceiling Batts™ and Gold Wall Batts™ can deliver maximum performance guaranteed for the lifetime of your home. Today, you need to be more environmentally aware; insulation helps maintain a stable temperature in your household, which means reducing the use of electricity to power your ACs. This leads to a reduced carbon footprint and helps reduce the use of fossil fuels that contribute to climate change. Austral Insulation is committed to providing high quality insulation to make comfortable living environments. Call 07 3249 1888 today and allow us to do all the work for you! Thermal insulation you can reduce your gas and electricity bills, help lower your carbon footprint and enjoy a more comfortable living environment with less temperature changes and lower noise levels entering your room. Thermal insulation regulates the temperature in each room of the house so that the heat remains the steady between rooms and floors in the building. A well-insulated room should not show drastic variances in temperature between other rooms. Along with comfort, thermal insulation helps minimize energy costs. A poorly insulated structure costs you money, but it is also harmful to the environment. On average, a home loses 20 – 30% of its heat through its walls and roof and even more when not properly insulated. That value equates to wasted energy dollars, too. It’s easy to blame increasing in a gas or electricity bill on rising fuel costs, but the fact is much of what you spend on utility bills is leaking into the atmosphere. The more intense the temperatures become outdoors, the greater the demand for fuel to keep your home comfortable. There is no argument that the fuel costs will always rise. Mother Nature seems to be doing her best to present us with challenging weather patterns. Thermal insulation is one method you can use to keep money in your pocket over the long run. The cost of beefing up thermal insulation in your home can more than pay for itself in just a few months. Thereafter, the savings in utility bills is money back in your pocket. Contact our thermal insulation experts today at 07 3249 1888 to find out what product is recommended for your home. Welcome to the Austral Insulation Brisbane Blog, Stay tuned – in the weeks to come, We will be publishing a number of Articles on Thermal Insulation, Acoustic Insulation, Ventilation, Moisture Control, Commercial, Industrial, Solar, HVAC and plenty more – please subscribe to our RSS Feed, follow us on Twitter (@australbrisbane), or Facebook.